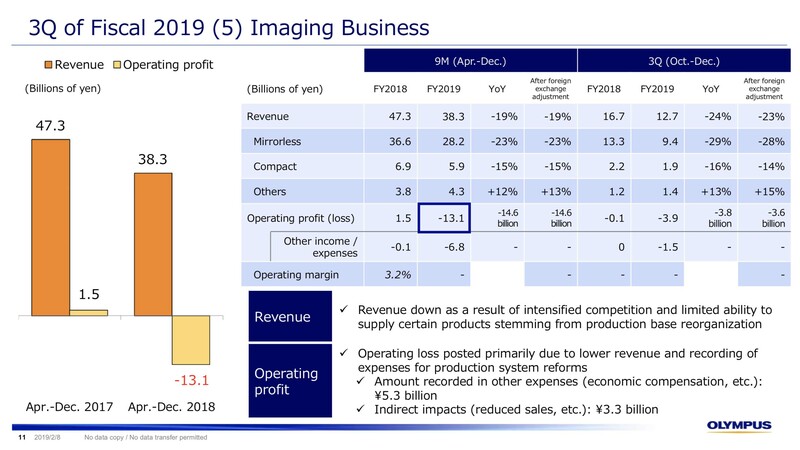 Consolidated revenue in the Imaging Business amounted to ¥38,338 million (down 19.0% year on year), while operating loss amounted to ¥13,129 million (compared with an operating profit of ¥1,493 million in the same period of the previous fiscal year). The Imaging Business’s revenue declined due partly to the impact of constraints on supplies of certain existing products and on the number of new products in conjunction with intensifying competition for mirrorless cameras and restructuring of manufacturing locations. As a result of a decrease in revenues and the recording of costs associated with the restructuring of manufacturing locations and impairment losses of ¥1,345 million, operating loss was recognized in the Imaging Business.